How Bullet is used is largely determined by the data source it consumes. Depending on what kind of data you put Bullet on, the types of queries you run on it and your use-cases will change. As a look-forward query system with no persistence, you will not be able to repeat your queries on the same data. The next time you run your query, it will operate on the different data that arrives after that submission. If this usage pattern is what you need and you are looking for a light-weight system that can tap into your streaming data, then Bullet is for you! Bullet is used in production internally at Yahoo by having it sit on a subset of raw user engagement events from Yahoo sites and apps. This lets Yahoo developers automatically validate their instrumentation code end-to-end in their Continuous Delivery pipelines. Validating instrumentation is critical since it powers pretty much all decisions and products including machine learning, corporate KPIs, analytics, personalization, targeting. This instance of Bullet also powers other use-cases such as letting analysts validate assumptions about data, product managers verify launches instantly, debug issues and outages, or simply explore and play around with the data. Here is a link to our blog post condensing most of this information if you want to take a look. See Quick Start to set up Bullet locally using Spark Streaming. 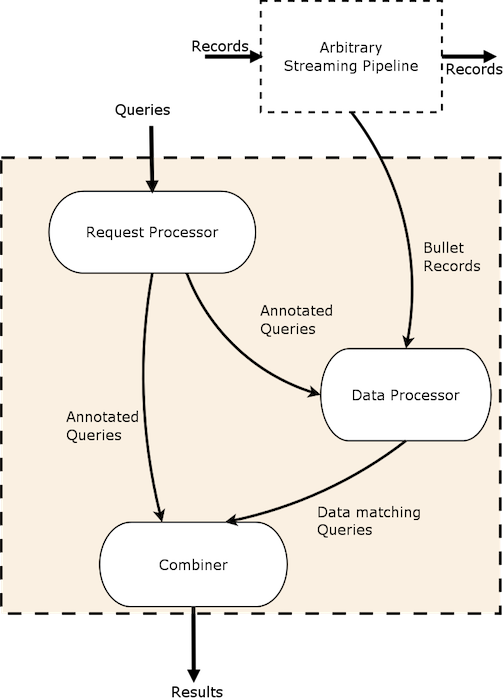 You will generate some synthetic streaming data that you can then query with Bullet. To setup the Bullet Backend on a stream processing framework. Currently, we support Bullet on Storm and Bullet on Spark. To choose a PubSub implementation that connects the Web Service and the Backend. We currently support Kafka and a REST PubSub on any Backend and Storm DRPC for the Storm Backend. The UI also needs an endpoint that provides your data schema to help with query building. The Web Service you set up provides a simple file based schema endpoint that you can point the UI to if that is sufficient for your needs. Bullet queries allow you to filter, project and aggregate data. You can also specify a window to get incremental results. Bullet lets you fetch raw (the individual data records) as well as aggregated data. See the UI Usage section for using the UI to build Bullet queries. This is the same UI you will build in the Quick Starts. For examples using the API, see Examples. These are actual albeit cleansed queries sourced from the instance at Yahoo. A maximum duration is reached. In other words, a query runs for a defined time window (which can be infinite). A maximum number of records is reached (only applicable for queries that are fetching raw data records and not aggregating). Projections allow you to pull out only the fields needed and rename them when you are querying for raw data records. Aggregations allow you to perform some operation on the collected records. LIMIT or RAW The resulting output would be at most the number specified in size. If you GROUP with no operation, you are performing a DISTINCT on the field(s). If you GROUP with no field(s), you are performing the operation(s) across all your data. Windows in a Bullet query allow you to specify how often you'd like Bullet to return results. See documentation on the Web Service API for more info. The Bullet Web Service returns your query result as well as associated metadata information in a structured JSON format. The UI can display the results in different formats. It is often intractable to perform aggregations on an unbounded stream of data and still support arbitrary queries. However, it is possible if an exact answer is not required and the approximate answer's error is exactly quantifiable. There are stochastic algorithms and data structures that let us do this. We use Data Sketches to perform aggregations such as counting uniques, and will be using Sketches to implement some future aggregations. Sketches let us be exact in our computation up to configured thresholds and approximate after. The error is very controllable and quantifiable. All Bullet queries that use Sketches return the error bounds with Standard Deviations as part of the results so you can quantify the error exactly. Using Sketches lets us address otherwise hard to solve problems in sub-linear space. We uses Sketches to compute COUNT DISTINCT, GROUP, DISTRIBUTION and TOP K queries. We also use Sketches as a way to control high cardinality grouping (group by a natural key column or related) and rely on the Sketching data structure to drop excess groups. It is up to you setting up Bullet to determine to set Sketch sizes large or small enough for to satisfy the queries that will be performed on that instance of Bullet. The image above shows how the various pieces of the Bullet interact at a high-level. All these layers are modular and pluggable. You can choose an implementation for the Backend and the PubSub (or create your own). The core of Bullet is abstracted into a library that can be reused to implement the Backend, Web Service and PubSub layers in a platform agnostic manner. The core of Bullet querying is not tied to the Backend and lives in a core library. This allows you implement the flow shown above in any stream processor you like. Implementations of Bullet on Storm and Bullet on Spark are currently supported. You can also very easily implement your own by defining a few interfaces that we provide. The Bullet Web Service is built using Spring Boot in Java and the UI is built in Ember. In practice, the backend is implemented using the basic components that the Stream processing framework provides. See Storm Architecture and Spark Architecture for details. Bullet is licensed under the Apache 2 license.